Understatement of 2018 thus far: I love coffee. I love coffee so much, one of the lads started referring to me as ‘iced latte’. I’d like to think that I’ve overhauled Vanilla Ice in the contest for best white boy rapper name. Say hello to Iced Latte! But for now, I’m putting my rap career on hold and instead, I’m here to talk to you about the coffee scene in New York City. The City That Never Sleeps likely doesn’t sleep because of the numerous coffee places around the place. It’s something I first sampled on my maiden trip to New York in August 2015. I had just started drinking coffee that summer and I must say, New York blew me away. Everywhere you look, on every block and every street corner, there’s coffee. Affordable places, high-end places, and everything in between. It’s completely unavoidable. Now, I know that many people point to the cost of coffee. Why buy coffee when you can just make your own at home? Well, the act of buying coffee makes one feel all warm and fuzzy inside. Quite simply, I know that trained baristas make better coffee than I could ever dream of. I probably overdid it during my year Stateside – multiply 365 by 4 or 5 and you get the estimated number of coffees I drank over the course of the year. Oh the expenditure! Now that I’m home, I’m getting used to Kenco instant coffee and my sister’s Lavazza coffee machine. I may have cut a number of zeros off my coffee expenditure, but I still yearn for a cuppa joe in the Big Apple. So on that note, here are some of my favourite coffee places in New York. Culture Espresso was a favourite at Sprinklr, and quickly became a favourite of mine. There are three Culture locations in the city, but we usually went to the cafe at 247 W 36th St as it’s just a block from the office. 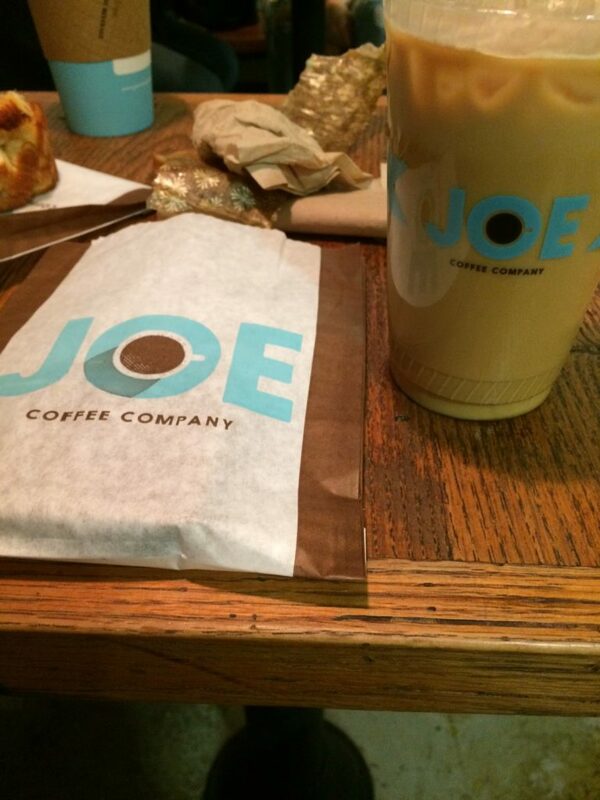 Not only is the coffee top notch, the cookies are made in house and they’re simply unbelievable. Another favourite at Sprinklr, Hole in the Wall is exactly what it says on the tin. In order to get to the coffee house, one has to walk into the 420 Fifth Avenue Condominium Complex. Walk into the building, go straight, and there you’ll see Hole in the Wall. It’s a compact place but it packs a punch. Not only is the coffee great, their sandwiches are also sensational. In true Millennial fashion, I liked the avocado smash sandwich. Lovely stuff. 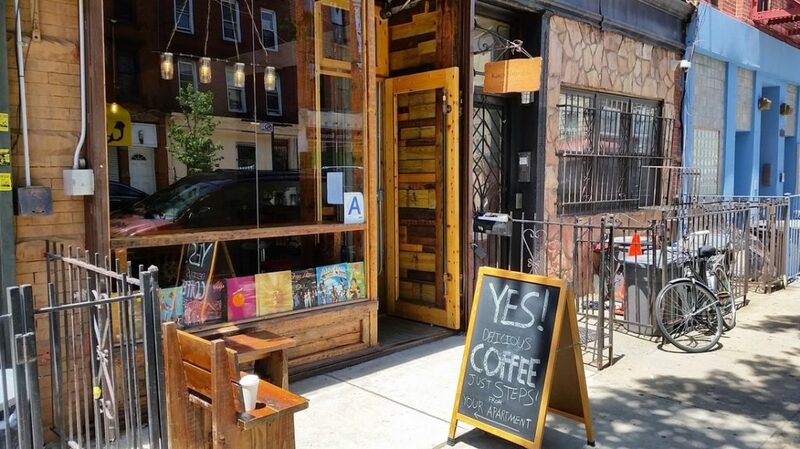 On we go to probably my favourite coffee place in New York. From humble beginnings in the West Village (pictured up top), family-run Joe Coffee has spread throughout New York and, more recently, Philadelphia. Its coffee is magnificent in all forms, especially latte. And the baked goods are sublime, especially the peanut butter blondie and anything with chocolate. 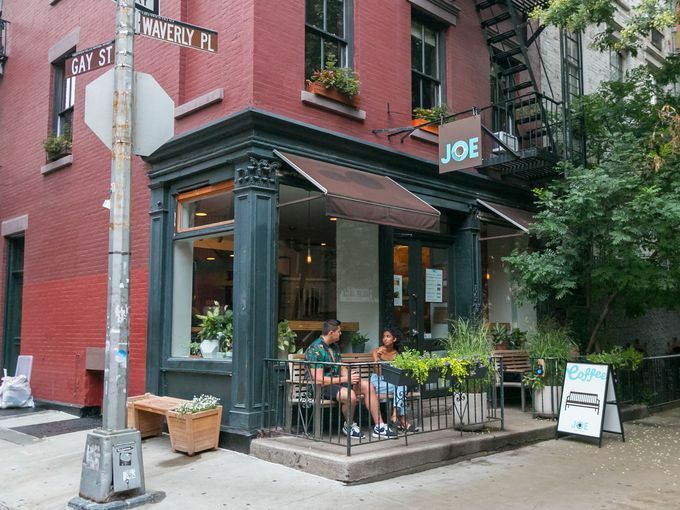 Location-wise, Joe Coffee is in most parts of Manhattan as well as one location in Brooklyn Heights, where 100% of Joe’s coffee beans are roasted. My two usual spots were the kiosk at Bryant Park and the Upper East Side location at 1045 Lexington Avenue. Enjoy a stroll through Central Park and then settle down for coffee and a treat at the latter location. That’s exactly what I did in the photo below, and it was always bliss. What I imagine is surely one of Brooklyn’s finest coffee destinations, Kava Shteeble is a quaint coffee house in Bedford–Stuyvesant. Unfortunately it was a late discovery: my first visit to Kava Shteeble was at the start of my last week in New York. But for the remainder of that week, I kept coming back for more. The coffee is very reasonably priced and of very good quality, and the croissants go down an absolute treat. There’s also a large outside area at the back but, by the first week of November, the weather was getting much colder. Therefore, I settled at the communal table and got some work done. Last but not least, Le Pain Quotidien is an ideal brunch and coffee destination. It may be a bit pricier than other coffee places, but the food and drinks menu is great. My usual Le Pain location was its restaurant adjacent to Bryant Park. And on my last trip there, I think I ordered the most Millennial meal imaginable: avocado toast and a vanilla iced latte. Yes, I am occasionally that guy. I first fell in love with Dunkin’ Donuts during the summer of 2015 but when I moved Stateside in October 2016, I wanted to try new places. Therefore, I took a long break until September 2017, when I discovered a Dunkin’ just minutes from my apartment in Woodside. The love affair resumed for my final months in New York. I stepped into Maison Kayser only a handful of times during my year in New York. For their baked goods alone, I’d go back in a heartbeat. Luckily, their coffee is also excellent. I don’t think I need to go into too much detail on Starbucks. Millions of people can’t get enough of it, while others think it represents the face of capitalism and corporate America. I often stepped into my neighbourhood Starbucks when living in Washington Heights. But after discussing the coffee giant with locals and especially after listening to this podcast, I have a newfound appreciation for the brand. Some may already know this, but the customer experience one gets through the Starbucks App is sensational. Furthermore, the company gives free college tuition to employees as well as military veterans and their families. I think that’s something to be admired. So there you have it, my favourite New York coffee places as well as some honourable mentions. Of course, there are countless other coffee places I never got around to. One day, I’ll do a coffee tour of New York and make a documentary about it. Let me know if that prospect intrigues you and we can start a movement.